Kill or be Killed Vol. 4 review – AiPT! A good, but not great conclusion to Brubaker and Phillips’ crime noir. 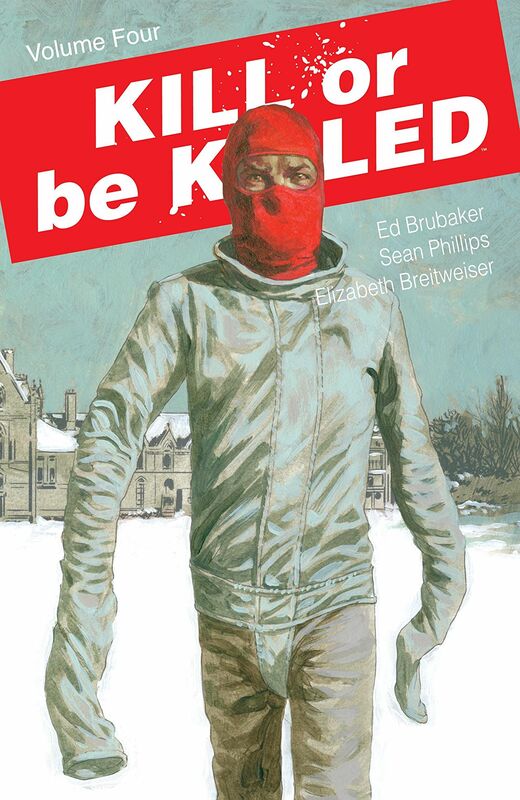 Since the very beginning of Ed Brubaker and Sean Phillips’ Image title, Kill or be Killed has never broken any new ground in terms of being a gritty crime noir, a genre that is second nature to the two creators. Despite that, however, this comic has always entertained with its bleak exploration of crime and corruption through the psychologically troubled mind of grad student-turned-vigilante Dylan, who has reached the end of his journey in the fourth and final volume of Kill or be Killed. After realizing that the demon that has driven his vigilante alter-ego is a hallucination born out of his family’s mental inheritance, Dylan is trying to maintain his normal life despite this presence constantly whispering over his shoulder about the evil around him. Obviously, the desire of normalcy doesn’t work and Dylan checks into a mental hospital, set in the snow-covered countryside, where unfortunately the problems of before continue to haunt him. Considering the lack of originality, the creators do at least find new ways of taking Dylan out of his comfort zone and certainly the setting of the mental hospital adds to the progression of his psychology. During his time there where he is no longer driven by the Demon, but his own instincts and based on the mistreatment towards patients by one certain staff member, Dylan wants to rid the grayness in our world that isn’t simply black and white. Given Brubaker’s love of crime noir fiction, he is all about the voice-over — which is my biggest issue with this series, no matter how much he wants to subvert the genre conventions. I understand that narration can be used to know what a character is thinking, but there is a point where it can get too much as nearly every page (if not panel) has so many captions to give us every single thought that Dylan thinks of. It also indicates that this lone voice puts everyone else aside that would have their own views towards Dylan’s rehabilitation, such as his mother or his former lover Kira. However, this final volume does give Detective Lily Sharpe something to do, as the conversation between her and Dylan showcases their contrasting world-views, and yet they have to join forces when the criminals and the corrupt come knocking on their door. It also allows Sean Phillips and colorist Elizabeth Breitweiser to display some great art, in particular the mental hospital that is its own character with grim, shadowed interiors and stunning snow-covered exterior, which then goes bloody with the return of the Russians who serve more as a plot device than as characters. A good, but not great conclusion to Kill or be Killed, which hasn’t brought out the best of the Brubaker/Phillips collaboration. A fitting if bloody climax, grimly drawn by Sean Phillips. The main setting of the mental hospital is its own character as well as serving a purpose for Dylan’s own journey. I wish Brubaker would stop relying too much on internal monologue, given Phillips' expressive art. With the exception of Lily, the supporting cast doesn’t lend their voice much to the central narrative.